Dining chairs from LodgeCraft. 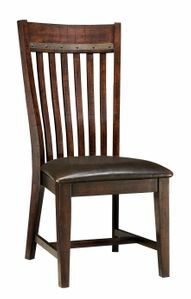 Over 50 styles of dining chairs to choose from in a variety of finish, fabric and wood types .We carry Mission style chairs made in the USA from Oak and Cherry, Log dining chairs made in the USA from Hickory and Pine, and several styles of hardwood imported dining chairs. We also have a selection of outdoor wood dining chairs. Stop by one of our two Montana showrooms or visit us online to to complete your dining room.